Anyone who likes cars remembers the ones they grew up around, with fondness or otherwise. Rather than the belching, American bruisers so many of my friends enjoyed as kids, my parents were part of the original yuppie construct, and they consistently chose foreign, quirky cars over luxurious or fast ones. Our 1992 Saab 900 sticks with me even now, thanks to its endless list of absurd traits that at the time, seemed common. What I mean is: an ignition switch between the two front seats, and a manual transmission that had to be in “reverse” in order to remove the key. A hood hinged at the front. Literally rock-solid doors that I had to slam with all my age seven force to close securely. Most of all, though, the Saab became a symbol of our family. It was champagne over tan, a decidedly 1990s color. The seats were covered in a soft fabric resembling shorn terrycloth, which was actually very comfortable. Better than the vinyl of our 1985 Volvo wagon that I had to peel from my skin on warm days. I spent years in the backseat of that Saab, battling the 5 o’clock sunset and the familiar gobble-gobble of National Public Radio. It was mostly driven by mom, so I associate her smell and her driving style with it. That is, comforting and cautious. I never believed I would grow up to remember the car so fondly, or be an NPR geek myself. I overheard many times during its tenure that Jane liked to drive it because it felt solid and heavy. Safe in the rain and safe in an accident. 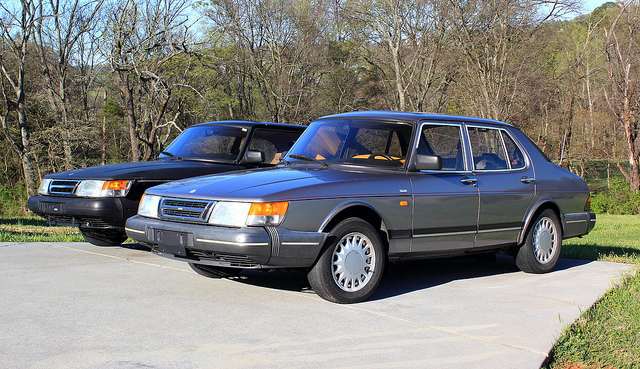 Later on in its career with our family, the Saab become the “slob,” as it often reeked of bananas that had fallen beneath the seats and cooked in the Florida heat. Through middle school it took us, until around the turn of the century, when the engine cooling system became unreliable and we were left stranded several times, at the mercy of AAA. We sold it and replaced it with a smaller, less practical car (the Volkswagen Cabrio), which was a short-lived novelty. My parents went on to own two more Saabs, both 9-3 models, which replaced the 900 as the small sedan in the lineup. The Swedish automaker, owned for many years by General Motors, met its demise just a few years ago, among subdued fanfare when its finances fell too far into the red, and a flood of investment in the form of a new owner never materialized. Volvo’s story may have ended similarly, were it not for a better relationship with its American owner (Ford), and a motivated new owner (Geely) ready and willing to inject it with billions of development dollars. The more life moves along, the more I feel the tug of history. Dwelling on memories and images from the prefrontal cortex serves few agendas, if only to recall fuzzy feelings, and let them serve as inspiration moving forward. I am learning a lot about memories now, with the passing of my mom, and in preparation for her memorial event. One part of her existence was our Saab, so I wanted to share. Does anyone else have pleasant recollections of interesting cars you rode in as a child?